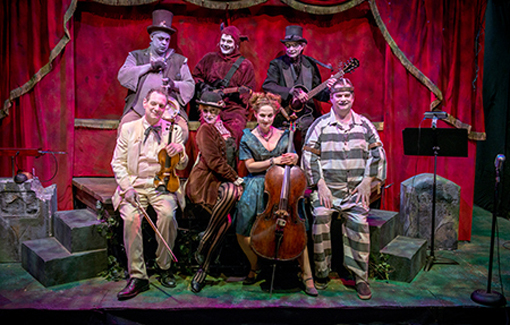 The Ghastly Dreadfuls, now playing at the Center for Puppetry Arts through Saturday, October 28, is the cleanest naughty fun you'll have this Halloween season! I saw The Ghastly Dreadfuls last year, during its 10th anniversary, for the first time and fully intend to make it a Halloween tradition, as apparently many in the audience already have. In fact, The Ghastly Dreadfuls has become an Atlanta cult classic! It's not going to shock you to your bones, but it might tickle your funny bone. It's not at all vulgar, but it might take your mind to naughty places. It's not for kids, but you'll feel like a kid again while enjoying this beautifully clever show. Allow me please to introduce you to the cast, then I'll share a brief interview with Jon Ludwig, co-writer of the show, and then I'll regale you with a bit about my favorite stories in the first and second acts. Everyone is Dreadful. Wait, they're absolutely wonderful, but everyone's "last name" is indeed Dreadful. Literally. Here's who they are and the musical talent they bring to the show. Jon Ludwig is Simply Dreadful. He narrates and plays guitar. Reay Kaplan is Lady Dreadful. She sings and dances! Spencer G. Stephens is Darkly Dreadful. He sings and plays assorted percussion. Jason Hines is Catly Dreadful. He meows a lot and plays the theremin. Robert Strickland is Shockingly Dreadful. He's brilliant on piano and sings. Kristin Haverty is Daftly Dreaful. She plays cello and sings. Scott DePoy is Dizzily Dreadful. He plays violin, guitar and sings. They're not only the band, they're the puppeteers!This is a most wonderful cast. You can tell that they're a theatre family from the very beginning. For me, that always make a performance more enjoyable. The Dreadfuls have met with demise and how they met their demise is how we're introduced to this spirited team of actors, musicians, singers, and puppeteers. 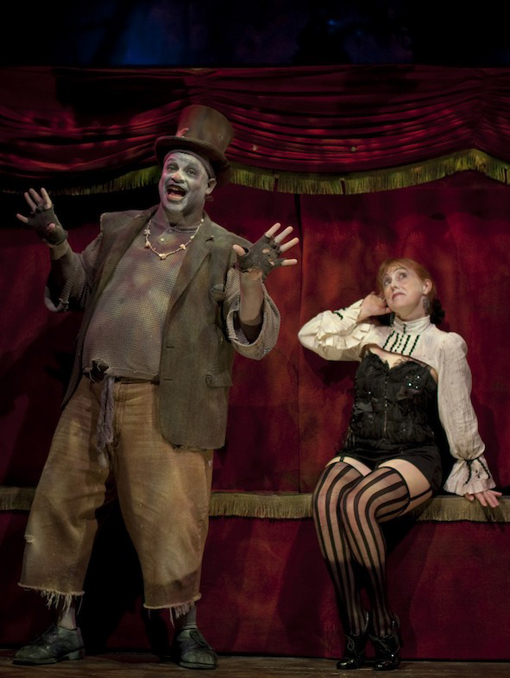 The "ringleader" is simply known as Simply Dreadful, played by Jon Ludwig who is the co-writer with Jason Hines. wanderlust ATLANTA: What are the not-so-obvious considerations in creating/performing a puppet show for adults vs. children? Jon Ludwig: We try to treat the kids like adults and the adults like kids. For many of our young audiences, this is their first theatrical experience. We don't want to talk down to them, but rather engage them on a level on which they can participate. They are learning to be an audience. For the adults, we want to get them back into the playfulness they had as kids. wanderlust ATLANTA: This show is quite "lively"...what's your favorite scene and why? Jon Ludwig: I like the final movement when we get somewhat serious and sing about the true nature of Halloween. After all the fun and frolic, it is a nice moment to reflect upon the spiritual before we get back to the party. 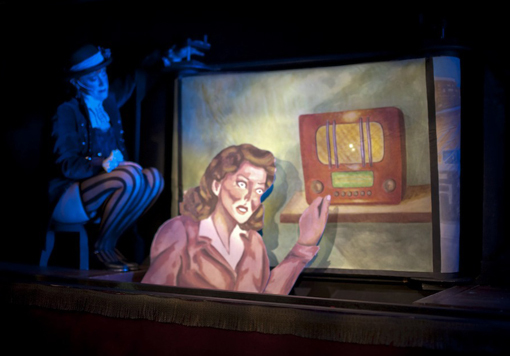 wanderlust ATLANTA: What do you believe is the "next big thing" for the art of puppetry? Jon Ludwig: There is remarkable progress in motion capture. Perhaps the next big breakthrough will be controlling the puppets with your mind. Jon also shared with me the various styles of puppetry used in the show. Are you ready for this? There is... Toy Theatre, rod, string, trick string, shadow, stop action shadow, flat cut out, glove, tabletop, and mask! I've been going to the Center for Puppetry Arts for years and some of those styles I'd not yet heard of! It's a spectacular show, never a dull moment! When Jon said that they "want to get them back into the playfulness they had as kids", meaning we adults, they do exactly that by opening the show with a sing-a-long! I don't sing, but couldn't resist the lure of the playfulness. I too belted out the chorus of "More Work for the Undertaker"! another little job for the casket maker! There are eight numbers in ACT I and seven numbers in ACT II, with potential encores! We had a couple and lots of people were up out of their seats dancing—especially the 20- and 30-somethings! Everyone gave them a standing ovation when the show concluded! NOTE: All guests are requested to leave the theater during intermission while they setup for ACT II. Many of the guests went to the beer and wine bar...not a bad idea! There's only one bar and one bartender, so bring your patience...not patients, please. In ACT I you'll see "The Girl in the New Dress" (pictured above), inspired by vintage Coca-Cola print ads according to a 2008 Creative Loafing article, and it's hilarious! On the scary side of this number, let's just say that "inner monologue", "stalker", and "bloody" come into play. My personal favorite performance in ACT I is "The 11:59". Inspired by "The Dark-Thirty: Southern Tales of the Supernatural", "The 11:59" is a tale of a railway man whose best friend has since met his demise. We're told bout The 11:59, a train that comes when it's your time to go. Our lead character hears the horn of The 11:59, signaling that he has only 24 hours to live. He's not ready, so he desperately locks himself in his apartment, doesn't answer the door, doesn't answer the phone. This splendid story is scary in that it explores our natural tendency to fear death, but in the end...well, you'll have to go see it to find out if he's scared to death...or something else. 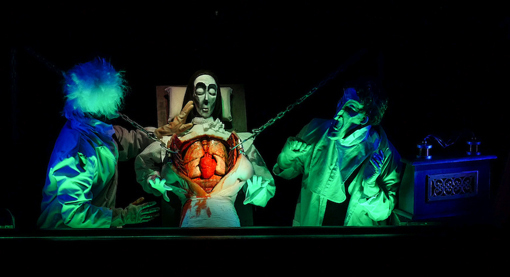 In ACT II, our hosts lay a splatter cloth in front of the puppet housing. Does this mean that the folks in the front rows are in a blood-bath zone? Perhaps. "The Horrific Experiment" (pictured above) is a love story with a nod to Dr. Frankenstein-esque experiments. It's can't-not-look mesmerizing. It's nothing like the anatomy classes you took in school, unless perhaps you're a professional specializing in autopsia cadaverum. This performance opens the heart in a way you've likely never experienced. My personal favorite performance in ACT II is "The Canterville Ghost", adapted from the short story story by Oscar Wilde of the same name. That short story has been performed on stage and the big screen and is brilliantly performed via puppetry in The Ghastly Dreadfuls. As in Wilde's story, a family moves into a castle where a nobleman had died and is now a ghost. The relationships between our ghost and various members of the new family residents are as unique as every member of any family. The mother hysterically shares a litany of cleaning products that can clean up a blood stain; the twin boys are as mischievous as our ghost is dead; the housekeeper is a scardycat; and the daughter is compassionate, caring for the living and the dead. Her compassion blossoms beautifully in the end. In a press statement, Jon Ludwig describes the evening as, "a kind of dark vaudeville with a variety of performance styles and sensibilities. There's really something for everybody." And indeed there is! This is an 18+ event—if you have kids, find a sitter and come out for an evening of laughs, clever dialogue, live music, and more kinds of puppetry than most of us ever knew existed! It takes place in the Downstairs Theatre where you'll also find a beer and wine bar that's open one hour before the show and during intermission. The Ghastly Dreadfuls is part of the Center for Puppetry Arts' New Direction Series for teens and adults. Check out their website for other upcoming show in the New Directions Series and be sure to see The Ghastly Dreadfuls by Saturday, October 28! Disclaimer: I've been a member of the Center for Puppetry Arts for some of the years since moving back to Atlanta in 2010, then other times I've been hosted by the Center and sometimes by their public relations firm BRAVE PR. This visit was via the latter. I'm grateful for the tickets (and how wonderful the staff is at BRAVE), but the opinions in my article are strictly my own.